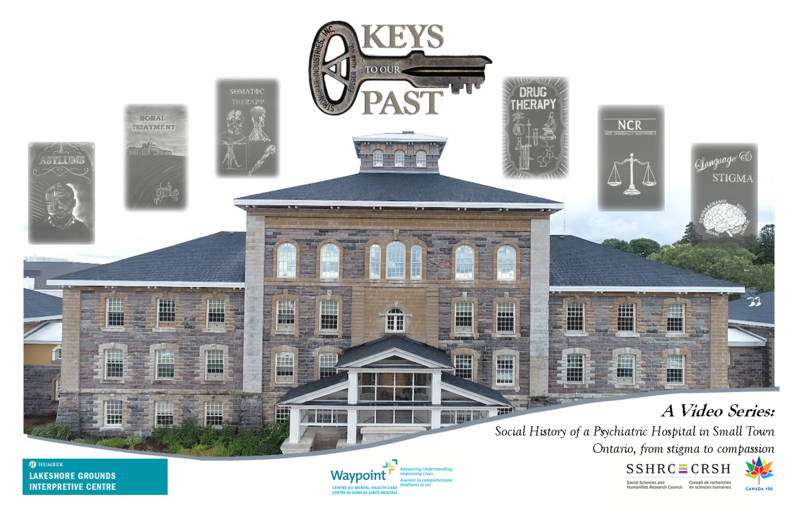 As previewed in a post from September, Waypoint Centre for Mental Health Care and Lakeshore Grounds Interpretive Centre have collaborated on a series of videos about the history of mental health care in Canada called Keys to Our Past. The films premiered earlier this month at the Humber Lakeshore Campus, site of the former Lakeshore Psychiatric Hospital. Funded by the Social Sciences and Humanities Research Council (SSHRC) as a Canada 150 grant, the project is composed of six pieces that are each roughly ten minutes long on a range of topics relevant to the evolution of care throughout the history of our nation, from its early foundations to its recent iterations: institutional buildings, moral treatment, somatic therapy, drug therapy, the not criminally responsible designation, and language and stigma. AHP conducted an interview with one of the series producers, Laura C. Ball, who is Waypoint’s Knowledge Translation & Implementation Coordinator. We discussed the making of the series, as well as its socio-political relevance to Canadian culture today. We’d like to thank Laura for taking the time to chat with us about the project! As historians of the field and as teachers, we appreciate the sensitivity and sophistication of its historiographic narratives, and we know our readership will as well. Shayna Fox Lee (SFL): How did the idea for the project develop? Also, give us some insight into the significance of including works such as Keys To Our Past in the Canada 150 activities. Laura Ball (LB): The idea for Keys to our Past initially came from a desire to extend the work that Jennifer Bazar had done during her post-doctoral fellowship position at Waypoint in Penetanguishene. She had created a wonderful resource – Remembering Oak Ridge Digital Archive & Exhibit – and we were hoping to secure funding through SSHRC’s Canada 150 grants to expand on her vision. We were thrilled to receive the Canada 150 grant. It was a tangible recognition that mental health and the mental health care system is integral to the foundation and fabric of our country. However, the real vision for the series came after we got the funding, and hired 2 students to work on the project: Rachel Gerow (MA student in Counselling Psychology, Yorkville University), and Gary Bold (BA student in Psychology, York University). The four of us got together and started to develop a plan. It was very student driven: we chose topics based on what they found interesting, and what they wanted to know more about. SFL: Tell us about John Leclair! He did such a great job conveying the often very nuanced content in a manner that is straightforward but also sociable, resulting in an eminently accessible series! LB: We literally could not have done this project in the way that we did without John’s participation. To most people at Waypoint, he is known as a Recreation Therapist in the Provincial Forensic (max secure) programs – and one who whole-heartedly believes in his clients and has hope for their future. What many don’t know is that he is also a talented stage and film actor. He has been working with the Huronia Players in Midland, ON for some time now. Once we had established our vision for the series, it had become clear that we needed an actor to be the face and voice of the series – it couldn’t be done by an amateur. Holly Archer – Waypoint’s Senior Development Officer, and supporter of this project – is also a member of the Huronia Players. She arranged the meet for us, and right away we knew he was who we were looking for. He was not only a skilled actor, but also passionate about his patients, and an avid consumer of historical writings (he had read almost every page of the Remembering Oak Ridge site!). He immediately grasped the kind of persona we were looking for: someone who was likeable, funny, persuasive, and speaks with an air of authority – kind of a hybrid between Mr. Rogers, Bill Nye, and Rick Mercer! John worked with us to develop the scripts to ensure that they were accessible, understandable, and sound like something he would actually say. He also enlisted the help of two other Huronia Players members: Ron Payne, who joined us on the film days to provide his Director expertise, and Wendy Roper, who provided John’s makeup. Despite all our preparation, though, the scripts were still being polished right up until the moment they were performed on film. John is actually reading off of a teleprompter – and some of the final cuts were the first time he had seen some of the material in the scripts! That speaks volumes about John’s skill and commitment to the project. Many working journalists can’t even read off a teleprompter, and John made it look effortless. SFL: The ‘study’ in which the films take place contains a wonderfully rich and diverse collection of artifacts that illustrate the institutional history, and also the history of mental health care and treatment more broadly. What fun the production of the set must have been! Any favourite pieces with share-worthy stories? LB: The set was an absolute joy to create (though admittedly, it took a lot of work!). The final set featured contributions from the Waypoint History Walk collection, the Lakeshore Grounds Interpretive Centre collection, items on loan from the Mental Health Museum, as well as pieces donated from private collections from Jenn Bazar, Kate Harper, Monica Murphy, and myself (Laura Ball). All of the items on display have an interesting history. However, I think my favourite has to be two items that appear separately on the set, but are presented as one display in the Waypoint History Walk: the section of the front gate from the former Oak Ridge building, and the Folger Adams key that was used to open it. For anyone who has visited or worked at Oak Ridge, those are usually cited as one of their strongest visual and auditory memories. The gate was profoundly heavy and large – even that small section is difficult to lift! And the key is similarly large and imposing. Together, they were a strong symbol of the security focus of the maximum security setting that was Oak Ridge. It was the gateway in and out of the facility. In recognition of that, the Folger Adams key is the symbol used for both the Remembering Oak Ridge site, and the Keys to our Past series. SFL: All 6 films have great educational value, each with potential uses in a wide variety of traditional classroom and extracurricular teaching contexts–are there any plans for promotion of their usage in universities or elsewhere? LB: Absolutely! Though we hope that the general public will enjoy these films, we recognize that the long-term value of the videos will likely be in educational settings. We are hoping to promote these videos as tools to use in the classroom for instructors of classes such as: History of Psychology, History of Psychiatry, Law and Psychology, and Abnormal Psychology. However, these videos touch on such diverse topics, that they will probably be more broadly applicable than we can foresee. For example, the Moral Treatment video discusses events relevant to the development of the disciplines of Occupational and Recreation Therapy. SFL: Likewise, the piece on Language and Stigma holds considerable emancipatory potential for assisting Canada’s public conversations about how social realities affect psychological experiences. How do you recommend institutions and organizations best employ that film as a resource? LB: At Waypoint, we are in discussions about how best to use it. So far, we’ve discussed the possibilities of using it as part of new hire and student orientations, and presentations to the public. We are currently planning to show it as part of a Rotary Club presentation in Midland, ON and other outreach events. We think that this video is foundational – even though it is presented last in the YouTube playlist, it is, in fact, the piece that drives why we should understand all of the other topics. We’re hoping that some of our other stakeholders and partners may see the value in these videos as well. SFL: And finally, but not least, the piece on NCR advocates powerful messages about 2014’s Bill C-14. I consider it to be an invaluable historiographic record for this political moment, providing a sophisticated synopsis of how legal language changes and cycles, and the consequences of those developments. Do you envision ways that it could be used to influence policy moving forward? LB: This section of the video was actually a bit of a difficult one for us. As the videos were funded through the Canada 150 grant, we felt a bit awkward about presenting a video that is so blatantly critical of federal law. However, after discussions with some of our stakeholders, we realized that it was absolutely necessary. The evidence simply doesn’t support Bill C-14, and every group who was part of the affected systems spoke out against the change. We hope that it can not only be a lesson for students about how policy is enacted (that sometimes it is developed based on emotional evidence rather than empirical evidence), but also to begin a conversation. With the current political push for “evidence-based” policy, we hope that the messages in this video will start a discussion about an area where evidence-based policy is needed. The April issue of Journal of the History of Medicine and Allied Sciences includes two articles that may be of interest to AHP readers. Titles, authors, and abstracts follow below. The paper examines the history of constitutional therapy in Weimar and Nazi Germany. Focusing on Walther Jaensch’s “Institute for Constitutional Research” at the Charité in Berlin, it shows how an entrepreneurial scientist successfully negotiated the changing social and political landscape of two very different political regimes and mobilized considerable public and private resources for his projects. During the Weimar period, his work received funding from various state agencies as well as the Rockefeller foundation, because it fit well with contemporary approaches in public hygiene and social medicine that emphasized the need to restore the physical and mental health of children and youths. Jaensch successfully positioned himself as a researcher on the verge of developing new therapies for feeble-minded people, who threatened to become an intolerable burden on the Weimar welfare state. During the Nazi period, he successfully reinvented himself as a racial hygienist by convincing influential medical leaders that his ideas were a valuable complement to the negative eugenics of Nazi bio-politics. “Constitutional therapy,” he claimed, could turn genetically healthy people with “inhibited mental development” (geistigen Entwicklungshemmungen) into fully productive citizens and therefore made a valuable contribution to Nazi performance medicine (Leistungsmedizin) with its emphasis on productivity.